1) Does he drool? Like, a lot? Does slobber just drip out of his mouth involuntarily when he sees yummies? 2) Does he always lie down after 2mins if nothing is happening? Us Danes have this motto: "Why stand when you can sit, why sit when you can lie down?" 3) Does he lean on people? See, they say this is a proof of how lazy us Danes are but I think it shows how smart we are - I mean, why hold our own weight if someone else will hold part of it for us? 4) Do people say 'horse' comments when he walks past them in the street? Like, EVERY time he goes out? There are lots more tests but these are good basic ones to start with! ps. don't worry too much if it seems that Puppy might be part-Dane. See, us Danes aren't born with many brain cells in our heads, even though we have a lot of space up there - I have 3 brain cells and I'm considered a Dane genius! :-) So I'm sure your Sharpei brain will easily outsmart Puppy and find ways to keep things like kibble for yourself! pps. a much more worrying thought...what if he's part-Human? Coz he could be growing into a Human Pup...they just keept growing and growing upwards and I hate to say it but they have a LOT more than 3 brain cells!! Well, I think Honey did a great job capturing the warning signs of a potential mastiff or great dane. I can only add that just in case you should watch out for any head butts from him as if he is an actual mastiff then his head is quite hard and a good ramming to your tender self would be most painful. We too love the photo of you in the leaves, Bolo. 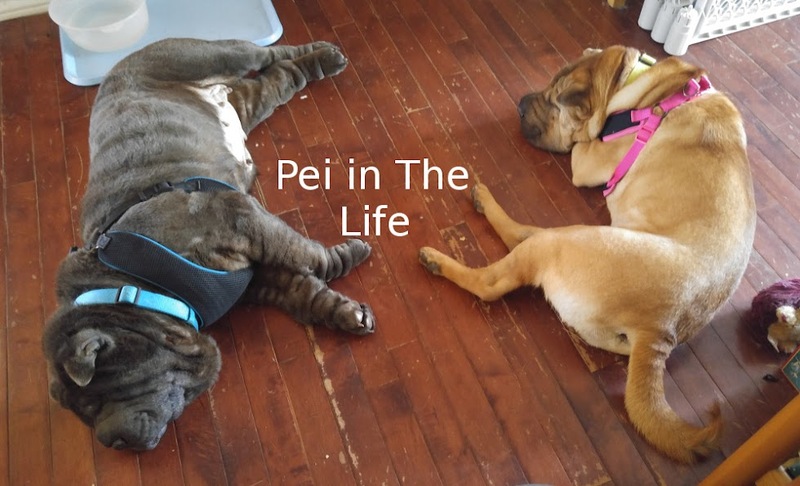 And as far as we are concerned, you can only ever be a 'Pei, lucky you! We join the fan club of those who love your in the leaves photo! 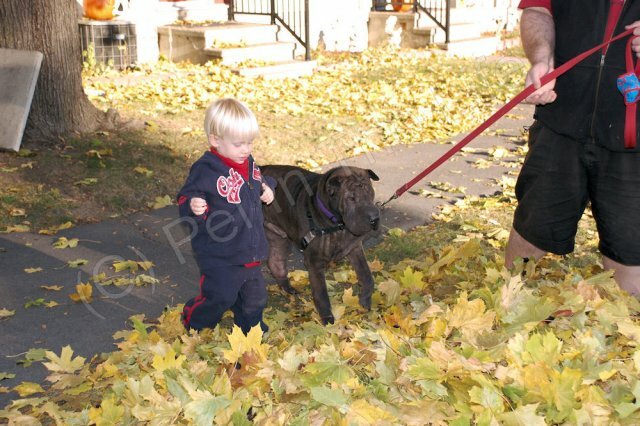 Gummi has also totally outgrown me - perhaps I, too, need to look into the great/mastiff genes..
Wow, your puppy is getting big! My cousin is bigger than me, but we still weigh the same at least. I think you have a while where you'll still outweigh (which means out-eat him)! BOL!